Much like I do every year around Easter, I’ve spent the last few weeks expecting and even somewhat planning to make either challah or hot cross buns. This has always been kinda funny to me, as when it comes to the traditional religious affiliations with both breads, they’re kinda opposed. but whatever. I wanted to try and make a unique variant to the originals, as I’ve already posted a regular Challah recipe on the blog in past years, as well as a Vanilla Bean Challah. Additionally, last year, my Easter bread were these Hot Cross Buns. I was drawing closer and closer to this weekend and still hadn’t decided on a particular recipe to try. My previous Challahs have only been three-braided ones, so I thought about maybe challenging myself by making a variation that had 4-6 braids and was like, coated in cinnamon sugar or something and calling it “Cinnamon Toast 6 Braid Challah”. And although I still think that sounds friggin amazing and I really just may try it in time for Passover this year, this particular week, just thinking about trying to pull that off wore me out. It was a no-go. After that idea was out, I considered doing a variation of Hot Cross Buns that were a vanilla overload; a vanilla scented dough, a thin vanilla glaze and a even a vanilla flavored ‘cross’. But that ended up just feeling like meh too. I wanted to do something REALLY unique this year. And pretty. So I started researching other Easter breads to experiment with and lo and behold, I came across something that caught my eye. 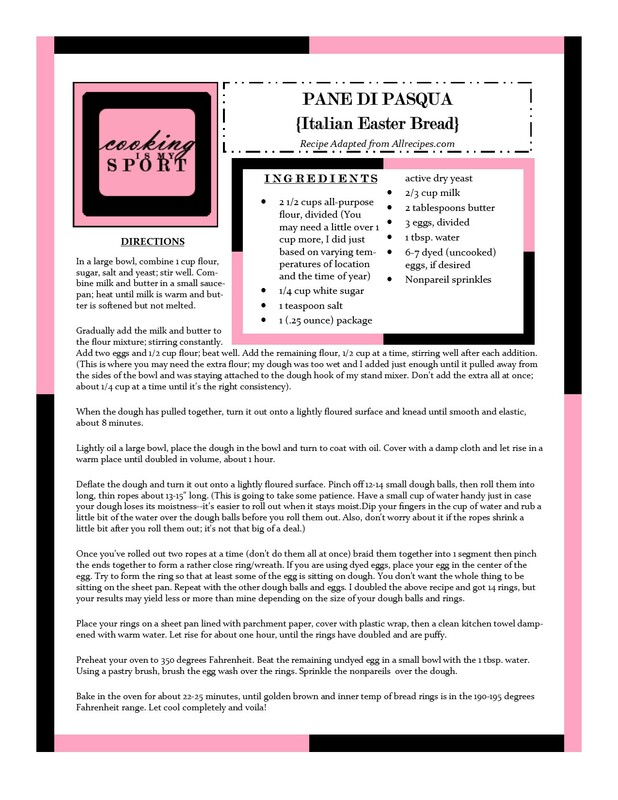 I first heard of Pane di Pasqua through Allrecipes.com, although the variation I saw there was just a regular braid with drizzled icing and sprinkles on top. I still bookmarked it because I thought it looked pretty and it got great feedback. Then, I read a random article in The New York Times about a famous Italian style bakery that makes the stuff each year that really got my attention. Their variation featured individual loaves of bread that they shaped around dyed Easter eggs. So what I ended up doing was taking the recipe I bookmarked from Allrecipes.com and adapting it in the similar style of what I had seen the old Italian bakery guy pull off. The best part is, it really wasn’t as complicated as I thought it would be. The most time consuming part of the whole thing for me was dyeing my eggs ahead of time, and then shaping the loaves themselves. However, as you guys can see, I made loaves that were filled with the Easter eggs as well as loaves that I decided to leave empty and just sprinkle with the nonpareils. This was partly because after egg number six, I just got tired of dunking them in and out of the pink/yellow dye. It was also partly because I had read accounts from other bakers who had attempted this recipe only to have the dye on their eggs slough off and stain the bread and got spooked. I wasn’t sure of whether or not the dye would stay on my eggs once they were in the oven and so, just to be on the safe side I did it half and half. Well fortunately, I had minimal staining from my egg dye and the overall results if I may say so myself were just PHENOMENAL. These loaves baked up light, fluffy and golden brown with no trouble whatsoever. And can we talk about the smell that filled my apartment while these were in the oven? It was like being IN an Italian bakery. Which outside of Bath and Body Works candles is pretty much the best aroma that could fill your pad, bar none. I’m sure you guys notice how I keep rambling on and on just to have an excuse to keep throwing pictures of this bread at you. Sorry. I can’t help myself. I feel like the guy who has the prettiest date at the prom and just wants to show her off to everyone. Come on, doesn’t just looking at it make you want to try this recipe yourself? OR, at least just make you crave ALLLLL the carbs? There’s still time to try this recipe before Sunday and I HIGHLY recommend that you do. This is a great tack-on project for after you finish dyeing Easter eggs with the kids and want an especially fun and gorgeous way to serve them up for dinner. Happy Easter everyone! Also, Happy Fiesta Friday #112, and a big thanks to Natalie @ Kitchen, Uncorked and Hilda @ Along The Grapevine for being our co-hosts this week. Gradually add the milk and butter to the flour mixture; stirring constantly. Add two eggs and 1/2 cup flour; beat well. Add the remaining flour, 1/2 cup at a time, stirring well after each addition. (This is where you may need the extra flour; my dough was too wet and I added just enough until it pulled away from the sides of the bowl and was staying attached to the dough hook of my stand mixer. Don’t add the extra all at once; about 1/4 cup at a time until it’s the right consistency). Once you’ve rolled out two ropes at a time (don’t do them all at once) braid them together into 1 segment then pinch the ends together to form a rather close ring/wreath. If you are using dyed eggs, place your egg in the center of the egg. Try to form the ring so that at least some of the egg is sitting on dough. You don’t want the whole thing to be sitting on the sheet pan. Repeat with the other dough balls and eggs. I doubled the above recipe and got 14 rings, but your results may yield less or more than mine depending on the size of your dough balls and rings. Place your rings on a sheet pan lined with parchment paper, cover with plastic wrap, then a clean kitchen towel dampened with warm water. Let rise for about one hour, until the rings have doubled and are puffy. Preheat your oven to 350 degrees Fahrenheit. Beat the remaining undyed egg in a small bowl with the 1 tbsp. water. Using a pastry brush, brush the egg wash over the rings. Sprinkle the nonpareils over the dough. Bake in the oven for about 22-25 minutes, until golden brown and inner temp of bread rings is in the 190-195 degrees Fahrenheit range. Let cool completely and voila! Pane di Pasqua is something I grew up with. I’ve never made it and we always got it at the Italian bakery every Easter. Most of the time the bread is stained with the dye which creeps me out so I wouldn’t eat that part. I like very much the way you did it. It’s festive and looks absolutely delicious. Once day I will try making this it brings back memories of my childhood. Beautifully done. This is a lovely Easter recipe, so colourful and delicious. Happy Easter! I love the look of the bread with the egg in the middle, but I’d be reluctant too I think, for fear of the dye coming off and staining the bread. But yours looks great! I was actually VERY surprised that it didn’t. Maybe my egg dyeing skills aren’t as amateurish as I thought they were lol Thank you! Beautiful! Looks just like my grams easter bread – so good! Perfection!! I seem to be running out of time to bake a special Easter bread this year- wish I could just transport yours to me! Love it. 🙂 Happy Easter to you & your family! These are beautiful and yes, they make me want to eat all the carbs, lol. Thanks for sharing the recipe and the story behind it at Fiesta Friday this week! Carbs just make the world a better place, don’t they? lol Thank you Natalie, Happy Fiesta Friday and Easter to you! What a lovely Easter treat! So pretty! Jess, can you tell me what widget you use for the recipes? Thank you and Happy Easter! Looks absolutely delicious. I love how you decorated it, very festive for Easter -yum! Jess this bread is just gorgeous! I like that they were individual loaves. Who wouldn’t love having their own? Hope your Easter was wonderful. You read my mind Jess 🙂 I’ve always wanted to make Brioche and I’m also intrigued with Easter Bread, looks like this recipe is the best of both worlds. Awesome. Super cute and colourful! This makes me happy!